A little over a year ago I “Stumbled Upon” (www.stumbleupon.com) a travel blog written by a 20-something who was traveling the world with little or no money. How was this kid able to take these fabulous vacations, multiple weeks a year, which could cost $10,000 or more each? What was his secret? How was it possible for him (or anyone for that matter), to fly first class to some of the world’s finest resorts, in some of the most exotic locations, and do it for a small fraction of the cost? By adopting his strategy, so far in 2012 my wife and I have spent a week in St. Thomas in a 2 BDRM suite, a week in Aruba with our adult children, a Father/Son baseball trip to St. Louis for the weekend, yet another trip with my wife to Aruba for two weeks, a weekend in NYC at the Waldorf Astoria, and an upcoming week in a beachfront suite at the St. Regis in Puerto Vallarta. OK, so these aren’t all exotic locations from all around the world, but still pretty nice. In 2013, we have plans for a family baseball trip, two weeks in Europe (in lay-flat First class seats), a return trip to Aruba, and a Napa Valley wine country tour following a trip to Seattle (again flying first class). That’s just the first half of 2013. All those trips combined in 2012 and the first half of 2013 “cost” me about $5000 plus 500K hotel points and airline miles. We will be staying in places like the Park Hyatt Vendome in Paris and Hyatt Andaz properties here in the States. The best news of all is that after all those point redemptions, I still have over 1.5 Million miles and points left! I have elite status with both American Airlines and US Air. Baggage fees, not us! I have mid or top tier status with Marriott, Hilton, Hyatt, Starwood, Accor and Club Carlson hotel chains. We get upgraded to preferred rooms, club floors or suites all the time because of my hotel status. I don’t usually pay for internet or breakfast either during our stays. The most amazing thing of all is that my spending isn’t that much different from the days of having only two AA credit cards. Nowadays, I just employ an awesome miles and points earning and redemption strategy. Disclaimer: The techniques depicted in this article involve signing up for multiple credit cards, sometimes on the same day, and then possibly canceling them before the annual fee is due. Sometimes you will re-apply for those same cards over again. (Called credit card churning). In the short term, your credit score could decrease, but in the long term it is likely to have little to no effect at all. (See figure 1). In fact, someone with a short credit history may actually see their credit scores improve by applying for multiple credit cards. If you are in need of a mortgage or large loan within the next 12-18 months, I would suggest that this strategy is not for you. However, if you are like me, have a successful Dental Practice that spends lots of money on lab bills, supplies, advertising, etc, have a good credit score, pay your bills on time, and don’t need to borrow money anytime soon, then this is your ticket to free travel! Let me show you the way. This is my actual credit score history from March 2012 to November 2012 when I began using MyFico.com to monitor my credit on a monthly basis. In that time, I have applied for and received eight new credit cards. My overall score has changed very little. Credit experts will tell you as long as your score is over 760, you will be offered the best loan rates by banks. I employ two credit-monitoring services. Credit Karma is free. MyFICO.com is $15/month. I would suggest that anyone who utilizes this strategy should have a credit report done prior to getting started. Your credit is one of your most valuable assets. Using this approach correctly will not damage your credit as long as you pay your debts on time and in full each month. Paying interest or fees on these cards will quickly erode any value you might gain from the points. The techniques used in this article while simple, may be easier to implement correctly when used in conjunction with reading my blog. I am here to help you navigate your way through this process. 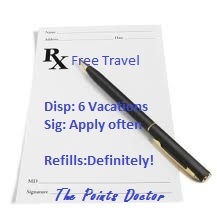 For more in-depth information on credit scores, the application process, the best current deals available and much more, visit www.ThePointsDoctor.blogspot.com. The Points Doctor is Bruce J. Wilderman DDS of Artistic Expressions Dentistry. Dr. Wilderman has a practice limited to Cosmetic Dentistry, serving patients of the Philadelphia Area since 1986. He and wife of 30 years enjoy traveling the world for little or no money with the points and miles they have earned from the credit card companies. Dr. Wilderman would love to teach you how to do the same. You may reach him at ThePointsDoctor@comcast.net. Disclaimer: In exchange for some of the links provided by me on my blog, I will receive a small compensation from the banks for your referral. While it is not necessary to use them, I always appreciate the use of my sign up links. I will always provide the most current and best credit card sign-up bonuses on my blog regardless of whether or not I receive compensation. Thanks Andrew. This has been a lot of fun so far. I have gotten a lot of interest from my friends both dental and non-dental since I started churning cards. I thought "why not share this with other Dentists"? We are the perfect candidate for this strategy. We have no difficulty meeting minimum spend requirements. Other blogs talk about all the ways to meet them, but they are nckel and dime strategies. Who else but another Dentist understands our unique business? Thanks for the info, I look forward to reading more.